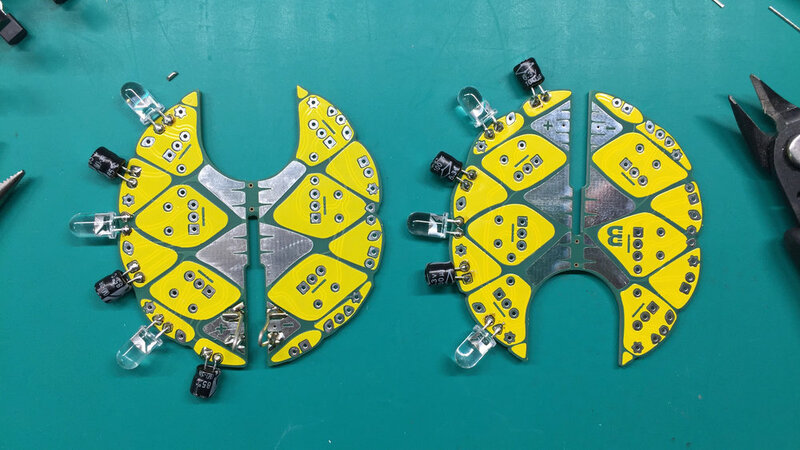 Ananas uses two PCBs to create an interesting three-dimensional construction. Each quadrant of the spherical shape contains its own three LED flasher. The flasher is a discrete circuit based around NPN transistors, resistors and capacitors. Ananas was project #20 of the Boldport Club. To keep the design clean whilst maintaining suitable markings the component locations are determined by the shape of the pads. A small quick reference guide is included in the kit that can be used to make sure parts are placed correctly and the right way around. Whilst it is possible to construct the kit any way you would like, there is a specific order of assembly that will help construction. The general idea it that you should solder on the components before soldering the PCBs together, otherwise it could be harder to construct. The idea is that you should end up with a construction that has only one strip of components per quarter facing the same direction. pictures on the right explain how to achieve this. Firstly place one board upright and then the other rotated 180°. 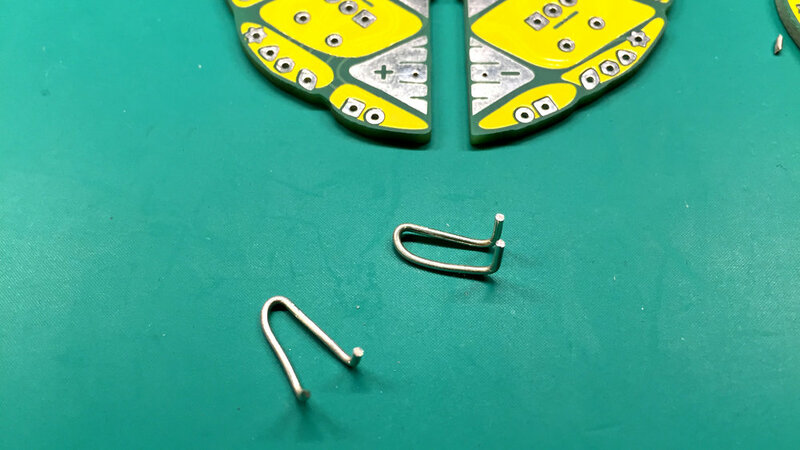 One of them will hold the battery, so make battery clips out of the included wire like shown, it should be as close as possible to the slot to allow good grip onto the battery. Using the provided guide for component orientation and position solder the components in on the left hand side only. Do not solder the "Inter-board resistor". But do solder in the Transistors (BJT) and the "On-board resistor" which are not shown. Then flip over the board and solder in the same components again on the left hand side. Now the fun bit! To solder the two boards together. To make it easier to push together it has been made to be a little loose. You will need to hold the boards together by placing on blue tack pads or use a "helping hands". It can also be done by tacking the boards in one place with solder then carefully bending the joint into the right position. You should then solder the boards together with solder on every pad that meets in the middle all the way around. Now everything is soldered on but 12 "Inter-board resistors". These resistors interconnect each quadrant from the diamond pad to the star pad. It doesn't matter which way around you do this as long as you maintain the same direction. For example every left diamond pad to every right star pad.